The Events section itself has also been improved, again! We've added a map where you can see at a glance where are organized all the upcoming Symfony events. You can find on the map: all the upcoming official Symfony conferences pinned in red and all the upcoming Symfony community events pinned in blue. Remember that lately new features were added to this section: all the past events are still shown and the «add to my calendar» button was added. But there is more! You can now find all the Symfony meetups listed in the upcoming community events. Any Symfony meetup created on meetup.com is automatically listed on Symfony website. And you can also add them to your calendar! 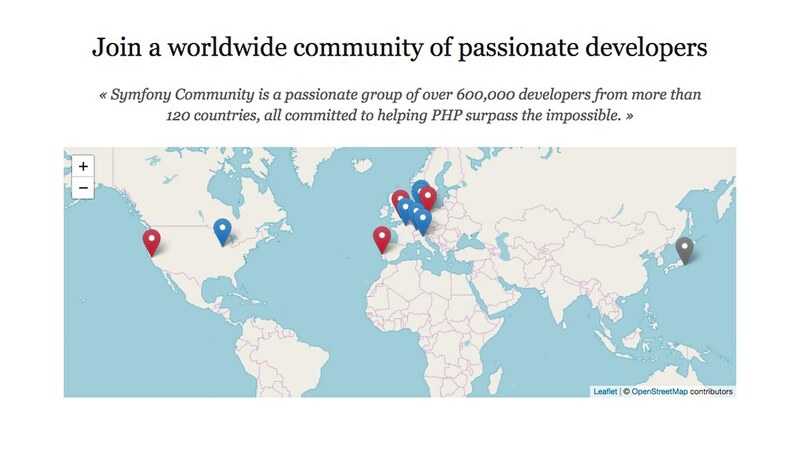 We aim to create a unique place for you to find the next Symfony event organized near you! If your meetup is not on the list, contact us or add it on the website. Once you add your event here or on meetup, a tweet is sent from @symfony to announce it and you can find it on the map. This way, all the Symfony events will get more visibility for everyone within the community. You won't miss anymore a Symfony event organized near you! I love that kind of improvement! It's currently throwing a 500 error: "An unexpected error occurred (error code: 500)." @Bogdan it's fixed now. Thanks for reporting it!